Blackwaterside is our go to band for all our Scottish themed events. The group led by Grammy award winner Susan Craig Winsberg embodies incredible musical and vocal talent. Over the many years the St. Andrew’s Society of Los Angeles has worked with Susan, she and her band have never failed to deliver. There are other Celtic bands out there but as the leading organization in Los Angeles devoted to the promotion and preservation of Scottish culture we demand the real thing and that is why we repeatedly rely on Susan and Blackwaterside. The leader of the Celtic folk quartet Blackwaterside has come to master all varieties of the flute. But if not for her mother's love of tea, Susan Craig Winsberg would never have been introduced to the exotic sounding instrument at all. When she was a 10-year-old living in Chicago, Winsberg had to pick an instrument to play in the school band. Already an accomplished pianist, she wanted to play the cello. But on Instrument Night at her school, the line for cellos was very long, indeed. Her mother, Millicent Craig Winsberg, grew impatient. "Being British, my mom said, 'Let's go home . . . I need my cup of tea,'" recalled Winsberg by phone from her apartment in Hollywood. Her dad said he'd get her an instrument, not to worry. Then the next day after work, he came home with a flute he picked up at a rental store. "I'm sure his thinking was how much easier this smaller instrument would be to deal with. And my initial reaction was only, 'Oh, how pretty.' I still to this day adore the cello, but I took to the flute like a dog on a bone. Before long, it felt like it was an appendage." In addition to becoming a virtuoso on all things flute, Winsberg has fostered an adventurous streak that takes herself and listeners on unpredictable sojourns. For instance, on her 1995 debut CD titled "Blackwaterside," she breaks from tradition by playing 10 Scottish and five Irish songs on the modern silver - rather than the wooden - flute. Winsberg decided to mesh her love of poetry and music on her subsequent release in 1999 of "La Belle Dame," the title inspired by John Keats's "La Belle Dame Sans Merci." With additional contributions from poets Kathleen Raine and Christina Rossetti--plus the beautiful, emotive voices of guests Susan McKeown, Kathleen Fisher and Molly Pasutti--the 12-song collection offers a richly-textured collage of words and sounds with a decidedly dark, melancholy tone. None of these fragile tales of love, longing and sorrow is as haunting as "When I Am Dead, My Dearest," which includes Rossetti's 1848 poem titled "Song," along with music composed by Winsberg. Backed by the eerie-sounding archlute, Celtic harp, violone and a 19th century wooden flute, McKeown sings: "When I am dead, my dearest/Sing no sad songs for me/Plant thou no roses at my head/Nor shady cypress tree." If the project's prevailing mood is too blue for some, Winsberg understands. "I don't like to shy away from anything just because it's on the dark side. It's an important part of the spectrum of human experience, and that's the emotional space I was in at the time. In fact, I was in a melodramatic mood for a whole year," she said laughing. "But beyond me personally, the Scots are known for their dark, sometimes downright depressing approach. I've been over there several times with my mom, who was born and raised in a town near Glasgow called Hamilton. People face rough physical elements and climate everyday . . . I mean, the Highlands and the Hebrides are cold, dark and difficult." That said, Winsberg insists that concertgoers won't be in for a downer when Blackwaterside-- which also includes new vocalist Susan Picking, guitarist Sean Clegg and percussionist Tim Blair - makes its Orange County debut Saturday in San Juan Capistrano. "We will play some of the heavier songs," she says, "but you'll hear some livelier tunes as well. Celtic music can be light and fun, and the mood will certainly be more upbeat than on 'La Belle Dame'. The great thing about this kind of music is that there are so many different emotional layers to uncover, and it's our intention to share all of its depth and variety." Prior to her fascination with Celtic music, Winsberg--whose American father is Jewish--was heavily immersed in classical music. 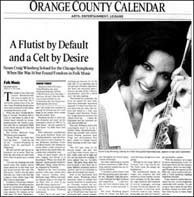 Formally trained, she performed as a flute soloist for the Chicago Symphony Orchestra at the age of 16 and since that time has performed in various symphonies throughout the U.S., Canada and Europe. But while auditioning for several German symphonies in 1986, Winsberg suddenly realized that her future lay elsewhere. "I reached a point where I felt that the orchestra scene just wasn't for me," she said. "I got fed up because it was just too rigid, technical and competitive . . . I still love, play and teach classical music, but Celtic music is more personal to me." For years, Winsberg played works by legends like Chopin and Bach but never felt brave enough to try composing. "Writing my first song, 'Spell of Creation,' was a big step for me. The Celtic music has simply emboldened me." The multi-faceted flutist, arranger and composer has also worked as a music teacher, actress, insect wrangler for the film industry, yoga instructor, and translator of several languages, including German, French and Spanish. Her latest passion is rescuing small creatures, such as cats, rabbits, guinea pigs, rats, and--let's not forget her favorite--spiders. "With the assistance of a couple of rescue organizations, so far I've found good homes for two bunnies, two guineas, three cats and a dog," says Winsberg, who appears on her web-site (www.craigrecords.com) with a 7-inch tarantula crawling towards her shoulder. "I was raised in a home that was called 'the zoo,' so I'm completely comfortable with animals. I'm just trying to find a home for one little homeless creature at a time--and I don't draw the line at warm, fuzzy and cute."